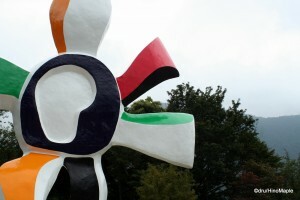 A famous sculpture near the entrance to the Museum. If you have the energy to continue into Hakone, you’ll have to travel a bit farther than Souzan. Most of the activities around Hakone are centred in the area between Hakone Yumoto and Souzan. From there, you can venture out past Souzan on a cable car and head out towards Lake Ashi. This is probably where you’ll get the best views of the countryside of Japan, if that’s what you are looking for. Do be aware that if it’s even slightly cloudy, you won’t get the best view of Hakone. The most famous view is from Lake Ashi where, on a clear day, you can see Mt. Fuji. Souzan is the starting point of the gondola that will take you to Owakudani, and then off to Lake Ashi. 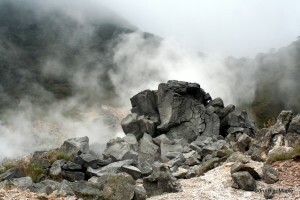 Owakudani is generally translated into great boiling valley, or hell’s valley. It’s an active volcano that is constantly emitting sulphur. Be aware that you’ll be near the top of the mountain, so the weather will be cooler and because of the sulphur, it will be very smelly. There is pretty much only one major route to follow. Head with most of the people and look for signs and maps. It can be a little difficult to get around, but once you are on the path, it’s pretty easy. The people who work at Owakudani are careful about the amount of sulphur in the air and will advise you to make your way down if it’s too dangerous. When you do get to the end of the hiking trail, there is a large boiling pool that is too hot to swim in. It’s nice for pictures, but the main point of the journey is to buy eggs. When at the top, you can buy the freshest boiled eggs in the area. The eggs are boiled in the boiling sulphur water, which actually makes the shells black. 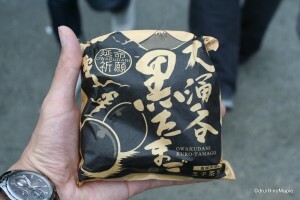 The inside of the egg is still natural, and the taste is normal, but the shell is black and a little brittle. The main selling point is that each egg you eat can add around 5 years to your life. This can be a lot if you are desperate. The trip out to Owakudani is something that isn’t necessary, but if you are interested in seeing new things, and experiencing Japanese travel culture, you should head here. The other reason to stop off at Owakudani is the ticket to get to Lake Ashi requires a transfer at Owakudani, so you might as well stretch your legs and enjoy the smell of sulphur. Lake Ashi, as I mentioned, is probably the most famous place in Hakone, yet one of the hardest places to get to. If you only want to go to Lake Ashi, you might be better off taking one of the highway busses out there. From Owakudani, you can take the second extension of the cable car to Lake Ashi. Do be aware that on major holidays, this area is also very busy and not easy to get around quickly. Once at Togendai station, it’s necessary to transfer to one of the sightseeing boats. During the high season, there are many boats trolling the lake. These have been called gaudy and I can imagine why. From the pictures, they are nothing but elaborate pirate ships that look like they were stolen from Disneyland. It does look like a very interesting ship to travel on and I’m sure the views from the ship are beautiful. There are only two stops, other than Togendai, for the Hakone Sightseeing Ships. It is Moto-Hakone and Hakonemachi. Both are equally important from what I’ve heard. 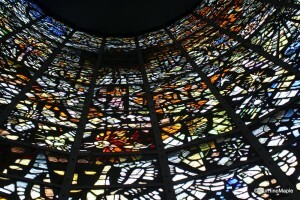 Stain glass art. Each panel had it's own image. At Hakonemachi, you’ll be within the old town of Hakone. Here, you can see some of the most historical buildings in Kanto, the greater Tokyo region. From here to Moto-Hakone, the old Tokaido Road heads into Tokyo. The old Tokaido Road is a historical road that was the only road in and out of Tokyo, heading west. In Hakonemachi, you can visit the Hakone Checkpoint. The Hakone Checkpoint is where all travellers, Japanese and foreign, had to check in to ensure they were allowed to travel within the country. Walking to Moto-Hakone is something that has been recommended. Along the way, you can walk down a path of cedars and once at Moto-Hakone, you can visit the Hakone Shrine. Taking the ship to Moto-Hakone would also be special as it’s a famous place for pictures. One of the torii, gate, is placed at the edge of the water making it a beautiful sight in the day. If you are adventurous enough, you can continue along the Tokaido road for about an hour or so. You’ll be able to read a small tea house and museum, as well as see some of the original unpaved road. Do note that the road is nothing more than a walking path. If you have two days, there are a lot of things to see and do in Hakone. If you only have one day, it’s a little difficult, but you can get all of the main places. If you are looking for nature and scenery, I’d recommend heading out to Lake Ashi first as it’s a little difficult to get there. Do be aware that I have never been there so most of my descriptions are from what I’ve read on other websites. I am also unsure as to the timing of reaching Lake Ashi itself. Owakudani, however, is a very quick stop, so it shouldn’t take too long. Hakone is so popular amongst Japanese people, that there are several ways to get there. By and far, the easiest has to be by train. All you have to do is spend a little extra to make it easy. Going by bus is also simple. If you are going to only one stop or overnight at an onsen, this would also be viable. Do note that you will have to be careful of the traffic. It can take two or three times longer to get back to Tokyo due to traffic on the expressways. Finally, you can drive yourself. If you have a total of four people going, this could be a lot cheaper. Parking in Hakone isn’t difficult and with modern navigation systems, you can easily find parking. Either way, have fun. Note:　I didn’t have enough time to head to most places mentioned in this post. 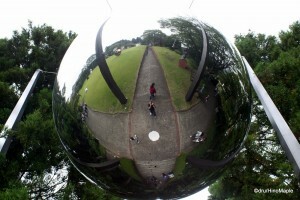 I have added pictures of the Hakone Open Air Museum to fill the space. This is part two of a two part series. To read more about Hakone, head back to Part I. This entry was posted in Kanto and tagged Ashinoko, boiled eggs, eggs, Fuji, gondola, Hakone, Hakone Checkpoint, Hakone Sightseeing Ships, Hakonemachi, Lake Ashi, Moto Hakone, Mount Fuji, Mt. Fuji, Owakudani, Souzan, sulfur, sulphur, Togendai, Tokaido, Tokaido Road, 大涌谷, 富士, 富士山, 神奈川, 箱根, 芦ノ湖, 谷 by Dru. Bookmark the permalink.